Pop Quiz Homework for InSync Webinar Participants, July 24th 2018 | Training from the BACK of the Room! Pop Quiz Homework is one of my webinar’s “Follow-Up” activities. Brain scientists call them “spaced practice” – activities that help move learning into long-term memory. And, if you haven’t already done so, be sure download the free note-taking handout from the webinar by clicking HERE. This handout contains many excellent, brain-based resources for you to explore. 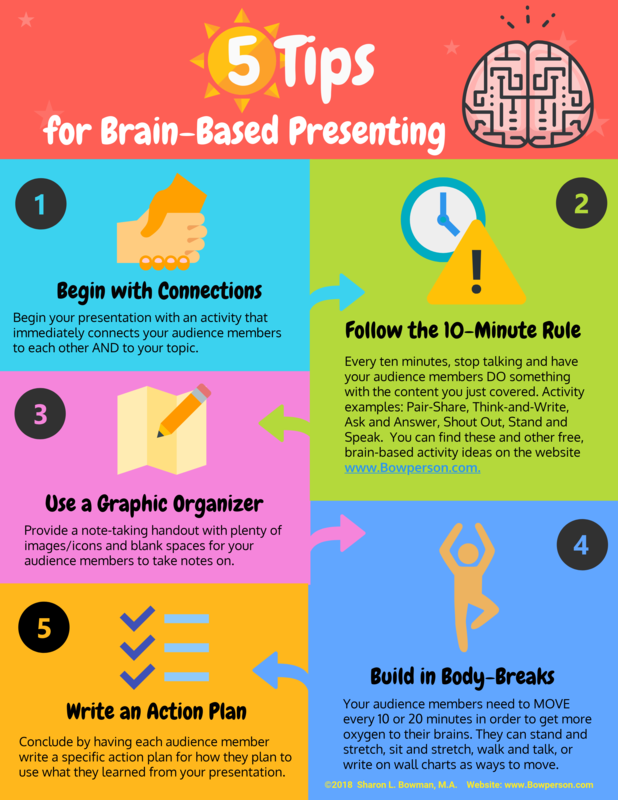 Finally, click HERE for the free, downloadable infographic that accompanies the webinar. I watched the recording of the webinar. I really liked how you added pauses for attendees to move during the webinar. Not only did it allow us time to reflect but also the pauses and the movement combined provided novelty and impetus to kickstart our attention. Throughout the webinar you incorporated many variations of novelty, contract, meaning and emotion. You used pop quizzes; thumbs and thumbs down; stand, stretch and speak; quick write, and my favorite were the eye-catching images. Your use of high-res, engaging photos really helped concepts to resonate and stay with me after the webinar. I plan to incorporate some stand and stretch moments and look at some of the image suggestions to jazz up my presentations. I’d really like to use more movement within my presentations. Thank you for sharing these tips and I fully enjoyed the webinar. What an enjoyable – and effective – webinar, Sharon! Your webinar’s departure from standard template-based slides certainly provided novelty. Having us switch back and forth throughout the webinar between being passive and active participants provided contrast. Your note-taking handout really helped establish meaning between the content and how I plan to use what I’ve learned when I design training. Your photo choices had a lot to do the playful and happy emotions I experienced during the webinar. After the webinar, I checked out your website and fell down many rabbit holes. 🙂 So many excellent resources!! And you have such a delightful presence that shines through your micro-courses. Visiting your site was so energizing and inspiring…thank you! The information presented in this training was an “eye opener” for me. It made me realize how I have been wrongly elaborating my presentations . This presentation provided me with an insight of the appropriate ways for engaging adult learners. At the same time, the concepts discussed (novelty, contrast, meaning and emotion) where included in the presentation. I noticed that the concepts were applied during various occasions throughout the training in different forms, including: pictures, colors, examples, quizzes, etc. I love how the elements were used throughout the presentation. I haven’t seen it discussed here and I could be wrong, but I think you might have been trying to pull a fast one. Your phone went off right before discussion Novelty, leaving that particular item ingrained in my memory. If it wasn’t done on purpose… then that was incredibly serendipitous. I love the non-virtual elements of having learners use the quick write and will definitely be looking for ways to implement this in my future facilitation. The four (4) elements provided a fresh look at the way presentations can be done to make the class interesting and get feedback/participation from the attendees. This format was new to my brain which made me pay attention and focus on what was being said. I liked the use of slides in the presentation. They were very powerful. I will remember to use this technique going forward if and when I have to present to an audience. This was a teachable moment. Novelty, Contrast, Meaning and Emotion kept me engaged. I listen to recordings many times as I am on the road so much. This 57 minutes whizzed by and I was taking Quick Notes throughout. I found my mind did not drift which can so readily happen when the webinar is recorded rather than live. Thanks for giving me these tips – will integrate more (I already use many) into my upcoming trianings. I loved the webinar and definitely saw the use of Novelty, Contrast, Meaning and Emotion during the webinar…you kept my ADD attention! I loved how the slides were pictures and not just the text that you were covering. That definitely provided Novelty to the presentation. And they were just regular pictures, but rather pictures with bold colors. I saw contrast in your use of various colors of text and font. Again, not just plain text, but wide sweeping marks with light colors against bright pictures. The text that was written was very short and to the point, thus holding my attention. You tied in Meaning for me, when you had me think about my own presentations and how I could tie the various elements into my courses. I can’t wait to put into use some of the new tools you presented! (I’ve already tried a couple just from things I’ve read on your website and they worked great.) For Emotion, I would have to say the use of humor truly helped keep me focused and on topic. I’m so glad you covered that piece as I have started sharing a story in the course I teach that ties in a practical use of my content but I always wondered if it was too much because it is a story that definitely pulls at the heartstrings. Now, I know I’m on the right track and will leave it as part of my presentation! Thanks for a wonderful session! GREAT presentation. I loved the CHANGE ANYTHING, and encouragement to avoid repetitious use of presentation tools. I utilized several, but could have been accused of repeating them too often. I liked your novelty in variety of photos and activities. Contrast was noticed by using different color schemes on the slides and text. Different font types, sizes, and location on the slides was better too. You provided meaning to me when you asked us to relate the material to our lives and introduce into our habits. My emotions were triggered through the photos and asking us about our past experiences. I am grateful to have found your blog and website! Novelty, Contrast, Meaning, and Emotion played throughout this presentation. Novelty the idea of getting “new” was to present material and that being demonstrated for us. Contrast the question being asked that made me recall prior knowledge. The two biggest pieces that I related the most to was Meaning and Emotion. The information being provided was something very relevant to what I do today and easy to adopt to my work environment. Which tied to my emotion of being excited sparking new creative thoughts, and thinking about how I wanted to share this content with the rest of my team. Thank you for a great and valuable session! Examples: Novelty and Contrast were demonstratedby making us stand up, stretch and speak and changed our environment. Meaning and Emotion you used photos and graphics, told short, quick stories about the dental students. I can identify another essential element of NOVELTY, CONTRAST, MEANING, and EMOTION used during the “Brain-Based Presenting” webinar to get MY brain to pay attention. It was the speaker’s voice. Notice how she used different time pacings of her speech. Different levels of sound, softer and lounder. Some slides were more formal, and some were very informal in language. It all added up to a powerful presentation. You utilized all for elements simultaneously by providing a new and contrasting experience (Novelty) versus the same old boring presentation. You provided meaningful an relevant content along with showing pictures and telling stories of how these elements would work, putting the elements into action. I teach at a university and am converting my curriculum to insert novelty and contrast so students learn better and retain what is being taught. I am also of course adding images and telling stories so teaching sticks…… I love TBR and am so thankful to have learned this. Can’t wait to learn more and dig more deeply into the content on your blog! Post-webinar homework: Hi Sharon, excellent job on the webinar. With each activity you suggested, you made sure to model each one. Sometimes, you told us about it first and then had us do something that was that activity. Other times, you had us try something first and then gave us what the activity was. Without fail, you demonstrated each activity you were recommending. You also gave tips along the way, such as how to structure the actual presentation slides so that they weren’t repetitive and boring. Thank you for a great webinar that will be immediately applicable! Novelty, Contrast, Meaning and Emotion were used multiple times to keep our brains more attentive. We were asked to switch between writing, sharing and reading/reviewing to add some contrast to the session itself. Since this was new material for me…the novelty was there. The pictures used elicited an emotional response much more than a piece of clip art would and the explanations as to how this affects the learners brain added some very valuable meaning for me. Great session and I was able to take some actionable tips away that I’m looking forward to using in the future!